poor quality or lack appropriate procedural protections may lead to the inappropriate application of the law, including the removal of rights and autonomy from persons who are capable of making their own decisions. Capacity assessment is in many cases the entry point to the Substitute Decisions Act, 1992 (SDA) or the Health Care Consent Act, 1996 (HCCA): the level of supports, options and navigational assistance available at this stage will significantly shape how individuals and families experience this area of the law. When this Chapter refers to “capacity assessment” or “assessing capacity”, it includes all Ontario mechanisms for assessing capacity, unless otherwise specified. When the Chapter refers to “Capacity Assessment” using the upper case, it is referring specifically to assessments carried out under the SDA regarding property and personal care. Ontario’s systems for assessing legal capacity in the various domains of decision-making are described at length in Part II of the Discussion Paper. mechanisms and supports for challenging an assessment. Each system has its own set of checks and balances for the overarching tensions between accessibility to the process and accountability, preservation of autonomy and protection of the vulnerable that underlie this process. The various capacity assessment systems also vary in their levels of process and the challenges of navigation. As well, the existence of multiple separate systems inevitably results in considerable complexity in the system as a whole. While different systems tend to affect different populations, in practice there may be considerable overlap for persons with mental health disabilities or for individuals who interact with issues of capacity at various points over their lives. In practice, there is considerable ambiguity and confusion related to the intersection and interaction of the systems. A very general overview of key formal mechanisms for assessment of capacity is provided on the chart on the next page. Informal capacity assessments play a very important role in the practical operation of Ontario’s legal capacity, decision-making and guardianship system. The way in which these assessments are carried out has a significant impact on the breadth of application of substitute decision-making in Ontario, particularly as these informal assessments occur more frequently than formal assessments. Service providers regularly informally assess legal capacity, to determine whether a particular individual can enter into an agreement or contract, or agree to a service. Certain service providers, such as health practitioners, have a legislated and long- standing duty to ensure that they have obtained valid consent to provide their services.127 Lawyers and paralegals will need to ensure that clients have the capacity to provide instructions, create a valid power of attorney, or to bring legal proceedings where appropriate.128 Service providers entering into contracts or agreements will have a strong interest in ensuring that the individual has the capacity to enter into the contract and that it is not voidable due to, for example, unconscionability or undue influence. In each case, this is a fundamental preliminary step to providing the service. If the consent or the agreement is not valid, there may be significant consequences for the service provider. A decision by a service provider that an individual does not have legal capacity to agree to a particular service or enter into a contract may trigger entry into formal substitute decision-making arrangements in order to access the service, for example through the activation of a power of attorney or the creation of a guardianship by a family member. The LCO’s project on Capacity and Legal Representation for the Federal RDSP provides an example of this dynamic. To open a federal Registered Disability Savings Plan through a financial institution, there must be a plan holder who is “contractually competent”. Where a financial institution does not believe that an individual has the legal capacity to be a plan holder, it may decline to enter into a contract. Currently, in these situations, the would-be beneficiary may need to seek a legal representative, such as a guardian of property or a person acting under a power of attorney for property, to open an RDSP. During the LCO’s consultations, some service providers expressed discomfort with their role in assessing legal capacity, indicating that they felt that they did not have sufficient expertise or skill to carry out assessments appropriately, and noting that this did not always fit naturally with other aspects of their role. This is particularly true where legal capacity and decision-making law is only a small part of the work that service providers are doing, and issues arise only on an infrequent basis. In many service organizations, it is front-line workers who will be directly encountering issues related to legal capacity and decision-making, and who will be tasked with identifying potential issues and applying correct procedures. It is also at the front-lines where pressures related to limited resources, competing needs and the tension between standardization and responsiveness to individual needs will be most acute. Financial institutions that are dealing with the life savings and financial security of their clients, including older persons and persons with disabilities, require certainty when clients or their legal representatives enter into contracts and provide instructions about the investment and disposition of the client’s financial holdings. In situations where a client’s actions make it less likely that presumptions of capacity can be relied upon, financial institutions should be able to obtain and rely on objective proof of a client’s capacity for decision- making and/or of the legal representation of the client. We suggest development of a process that engages private professionals, such as doctors or lawyers, to provide the requisite degree of oversight and who could also provide a certification, be it of capacity or the validity of the power of attorney, for example. Legislation should provide that a financial institution could rely on this certification, thereby allowing the financial institution to discharge its obligations to its client with certainty and without the need for court proceedings. During the consultations, the LCO heard concerns that unduly risk-averse approaches to assessment by service providers, or approaches that seem to be based on assumptions or stereotypes about certain groups of individuals, may have the effect of pushing individuals unnecessarily into formal substitute decision-making arrangements. Examinations of capacity to manage property under Part III of the MHA, were intended to provide a speedy and simple mechanism for ensuring that those admitted to psychiatric facilities did not lose their property due to their temporary inability to manage it. When a person is admitted to a psychiatric facility, an examination of capacity to manage property is mandatory, unless the person’s property is already under someone else’s management through a guardianship for property under the SDA or the physician has reasonable grounds to believe that the person has a continuing power of attorney that provides for the management of the person’s property. These examinations are performed by a treating physician, usually a psychiatrist. A re-examination of the patient may take place at any time while the patient is in the facility, and must do so prior to discharge. At the time of discharge, the certificate must either be canceled or a notice of continuance ordered. A physician who determines that a person lacks capacity to manage property must issue a certificate of incapacity, which must be transmitted to the Public Guardian and Trustee (PGT). The PGT then becomes the patient’s statutory guardian of property, unless the patient has a POA that comes into effect upon incapacity. If the physician fails to re-examine the patient prior to discharge, the guardianship of the PGT or any replacement will terminate. The MHA does not explicitly define incapacity to manage property, and the regulations offer no additional guidance in this regard. However, the definition set out in the SDA has been applied for the purposes of determining the capacity to manage property under the MHA. the right to apply to the Consent and Capacity Board (CCB) to review the assessment. to provide evidence in an application for court-appointed guardianship; or when ordered by a court. SDA assessments can result in a broad range of outcomes for the assessed individual, from having no legal effect to triggering a statutory guardianship. Nurses (and hold a certificate of registration). Qualified Capacity Assessors must have completed the requisite training and requirements to maintain qualification, which are significant. The Capacity Assessment Office (CAO) of the Ministry of the Attorney General maintains a list of designated capacity assessors. Capacity Assessors must comply with the Guidelines for Conducting Assessments of Capacityestablished by the Ministry of the Attorney General. The Guidelines aim to create a standard assessment protocol that will prevent inconsistent or bias-laden assessments. Failure to comply with the Guidelines may lead to a complaint to the Assessor’s health regulatory college. The Guidelines set out key principles that should inform Capacity Assessments, such as the right to self-determination and the presumption of capacity; outline the conceptual underpinnings of Capacity Assessments; elaborate on and explain the test for capacity; and set out a five-step process for Capacity Assessment. a right to receive written notice of the findings of the Assessment. For cases involving a finding of incapacity to manage property for the purposes of establishing a statutory guardianship in favour of the Public Guardian and Trustee (PGT), the PGT must, upon receipt of the certificate of incapacity, inform the individual that the PGT has become their guardian of property and that they are entitled to apply to the CCB for a review of the finding of incapacity. As well, for persons who become subject to statutory guardianship, there is a right to apply to the CCB for a review of the finding of incapacity, within six months of that assessment. The HCCA sets up a specific assessment process under Part III for decisions related to admission to long-term care homes (as defined in the Long–Term Care Homes Act, 2007) and under Part IV for consent to personal assistance services. The evaluation of capacity with respect to admission occurs when an individual’s family or health professional believes he or she should move into long-term care, and there is reason to believe the individual lacks legal capacity to make a decision on this issue. As with decisions regarding treatment, legal capacity is not supposed to be associated with the individual’s consent or refusal of consent. However, individuals are usually evaluated when they disagree with their family’s or health practitioner’s opinion. These evaluations can happen when a person is living in the community (at home, either alone or with someone) or when the person is in hospital, for example. Evaluations of capacity to make personal assistance services decisions and admissions decisions are performed by a special category of health professionals who are called capacity evaluators. Capacity evaluators must be members of the regulatory college of a limited list of professionals: audiologists and speech-language pathologists, dietitians, nurses, occupational therapists, physicians and surgeons, physiotherapists, psychologists and social workers. Although in reality those who perform evaluations may undergo additional training, there is no legal requirement that they do so. There is no guidance in the HCCA or regulations regarding the conduct of capacity evaluations. Nor are there guidelines, official policies or training materials, or mandatory forms. This is in striking contrast with the detailed guidance for Capacity Assessors under the SDA, as described above. In their place is a five-question form known as the “evaluator’s questionnaire”, so ubiquitous as to be almost standard practice. Importantly, the legal status of this form is unclear. The CCB and the courts have repeatedly held that simply asking the five questions on the form and recording the answers does not constitute a proper capacity evaluation. Experts and stakeholders have created numerous guides to provide additional guidance for those conducting evaluations of capacity to make admissions decisions. None of these guides have been endorsed by legislation or regulations. As a result, evaluators are not required to use them. It is not clear how much buy-in these guides have or how widely they are distributed. Oversight of capacity evaluators is carried out through the health regulatory colleges, with sections 47.1 and 62.1 of the HCCA requiring evaluators, like treating health practitioners, to follow the guidelines of their profession’s governing body for the information about the effects of their findings to be provided to the individuals they evaluate. Individuals in these circumstances do not have the procedural rights available in other contexts. For example, a person in these circumstances does not have a statutory right to be informed of the purposes of the evaluation, to refuse the evaluation, to have a lawyer or friend present, or to be informed of these rights prior to the evaluation. However, the standard evaluation form includes an information sheet that is to be given to the individual found to be incapable and boxes the evaluator should check indicating that the evaluator has informed the person of the finding of lack of capacity and of his or her right to apply to the CCB. Individuals undergoing capacity evaluations may be entitled to limited procedural rights based on the common law principles of natural justice. Individuals can apply to the CCB for a review of a finding of incapacity to consent to admission or personal assistance services, unless they have a guardian of the person who has the authority to give or refuse consent to admission to a care facility or an attorney for personal care under a POA that waives the right to apply to the CCB. Assessment of capacity to make treatment decisions is regulated under Part II of the Health Care Consent Act, 1996. The HCCA requires valid consent to treatment: if a health care practitioner is of the opinion that a person is incapable with respect to the treatment, then the person’s substitute decision-maker must consent on the person’s behalf in accordance with this Act. A health practitioner is entitled to rely on the presumption of capacity, unless the practitioner has reasonable grounds to believe that the person is incapable with respect to the proposed treatment:  where such reasonable grounds exist, the practitioner must assess to determine whether the person is capable of providing consent. This must take place any time a health treatment is proposed; the legislation applies equally inside or outside of a hospital, long-term care facility or doctor’s office. Assessments to determine capacity to make treatment decisions are specific to time and treatment. An individual may be legally capable with respect to one treatment but not another or capable with respect to a treatment at one time and not at another. The treatment-specific nature of legal capacity means that a new assessment must be done each time a new type of treatment is proposed. There is no specific required training related to assessing capacity outlined in the HCCA or regulations. Each college regulates the mandatory qualifications for membership, and may provide guidelines or publications that address the importance of obtaining consent before administering treatment. Health practitioners may also receive training from their employers. There are also a number of publications by advocacy organizations and experts that can be used by practitioners. Patient procedural rights vary depending on their setting and on the rules of the health regulatory college governing the professional who makes the finding. A finding of lack of capacity to consent to a treatment must be communicated to the patient. If the individual is a patient in a psychiatric facility, they are entitled to written notice under the MHA. Outside a psychiatric facility, a patient is not statutorily entitled to written notice of a finding of incapacity to consent to a treatment. Moreover, the form of notice a health practitioner must give and whether a patient must be informed of their right to apply to the CCB for review of the finding is governed by the health regulatory college to which the practitioner belongs. In practice it appears that colleges generally require that the health practitioner inform individuals who have been found legally incapable who their SDMs are and the requirements regarding their substitute decision-making role (if they are capable of understanding this information), as well as informing them about the right to apply to the CCB. These requirements are not consistent or provincially mandated, however. Importantly, all individuals who have been found incapable of consenting to a treatment can apply to the CCB for review of a finding of incapacity unless they have a guardian of the person who has authority to give or refuse consent to the treatment or an attorney for personal care under a POA that waives his or her right to apply to the CCB for review. Oversight of the quality of these assessments and the provision of procedural rights is mainly performed by the health regulatory colleges. Health professionals are overseen by their respective colleges. Patients can make a complaint to the practitioner’s health regulatory college if they believe the practitioner did not follow the proper procedure or over-stepped their authority. Issues related to assessment of legal capacity were the focus of considerable interest and discussion during the LCO’s public consultation. This issue is crucially important to this area of law because capacity decisions have extremely serious consequences for individuals and their families. Legal capacity decisions also have significant implications for a wide range of professionals and institutions. The concept of legal capacity and its operationalization raise some of the most difficult issues in this area of the law. Assessments of capacity may be misused or misunderstood. There is confusion as to the multiple mechanisms for assessing capacity, and the standards for assessing capacity. As well, there is considerable concern regarding the provision of procedural rights to persons who are assessed under the HCCA. The discussion below summarizes the LCO’s analysis regarding the most significant issues regarding assessments of capacity. An assessment of capacity may have very significant and long-term ramifications for the autonomy of the individual should it result in a finding that he or she lacks legal capacity. It is therefore important that assessments of capacity not be performed unnecessarily, or inappropriately. A formal assessment of capacity can also be a very upsetting and stressful experience for individuals, and may be felt to be a significant invasion of privacy. Courts have recognized that a capacity assessment is an “intrusive and demeaning process” and a “substantial intervention into the privacy and security of the individual”. It is important to take into account that this legislation is implemented in the context of particular supports and services, some of which are under enormous pressure. These pressures shape the application of the law, as families and professionals may attempt to employ it for means not intended, to solve the problems with which they are faced. No reform to the SDA, HCCA or MHA will by itself reduce or remove these pressures, and therefore no reform to the legislation will on its own resolve the problem of misapplication. One significant concern has been attempts to use assessments to control others or to further family disputes. Capacity Assessments under the SDA have the potential to result in transfer of long-term control over individuals or their assets, creating an incentive for abuse or misuse. While the SDA allows individuals to request a Capacity Assessment of themselves (as well as of another person), Verma and Silberfeld report that “[p]eople rarely refer themselves for assessment”. Rather, Capacity Assessments are often requested by a family member or a lawyer acting on behalf of a family member. While it is likely that in most cases the family member may be genuinely concerned for the individual’s well-being, it is also possible that they may be looking to benefit personally from a finding of legal incapacity, or may be using the Capacity Assessment in an ongoing rivalry with another family member. Silberfeld et al identify potential conflicts of interest in the context of requests for reassessments to restore capacity, suggesting that third parties who are not legal decision-makers for an individual may pressure the individual to request a reassessment so that the third party can informally take over the decision-making authority. The potential for these kinds of issues is apparent from the caselaw. The burden of dealing with potentially conflicting agendas and the possibility of nefarious purposes falls on the Capacity Assessor. Issues of legal capacity intersect in complicated ways with issues related to risk and vulnerability. While most would acknowledge that capable individuals have the right to live at risk, and that foolish decisions are not themselves indicators of incapacity, in practice these concepts may become difficult to apply. A number of service providers and professionals discussed the moral distress that may be associated with the struggle to discern the ethically and legally appropriate course to take in difficult cases. I would think the way I could respond to your question would be more about the impact that it has for our staff when there is that uncertainty and the distress that they take home with them because they’re believing one way and they feel very strongly about their professional credentials and wondering, you know… we recently had someone because, you know, really go through some real moral distress around this particular issue because they didn’t feel as though it was really lining up with their professional judgment. There may be a blurring of lines in some cases between the purposes of legal capacity and decision-making legislation and adult protection goals, which aim to address abuse and neglect of vulnerable adults regardless of the legal capacity of the individuals involved. While issues of risk and abuse certainly overlap with issues of legal capacity, it is important to also understand the distinctions. As a result of these misapprehensions, SDA Capacity Assessments may be unnecessarily triggered: for example, family members of vulnerable individuals may unnecessarily trigger the Capacity Assessment and guardianship process because they do not know how else to protect that family member from perceived or actual harms. I think sometimes it’s to get a quick solution … [to] a difficult situation or an issue, rather than kind of looking at that behaviour or whatever as some kind of meaning and some kind of needs that aren’t being filled. I mean, sometimes behaviours are really deceiving and people interpret that, you know, they can’t… they can’t do anything now so I’ll take full control. ARCH Disability Law Centre reported that it has observed situations in which family members, friends and service providers obtain or request capacity assessments in situations where it may not be necessary. In some cases it may be seem easier to use the capacity assessment process to have a person declared incapable since this leads to the imposition of a substitute decision-maker who has clear legal authority and responsibility for certain decisions. In addition, once a substitute decision-maker is in place, there is a perception that it is no longer necessary to accommodate the ‘incapable’ person or involve them in decision-making. Therefore it can seem more efficient, in terms of time and human resources, to have a substitute decision-maker than to support a person to make his/her own decisions. Similarly, in terms of evaluations of capacity to consent to long-term care, family members may trigger an evaluation because they are concerned about the risks that the person is facing in the community and the level of supports that he or she is receiving. I would just add that from the community side of things, I’ve often seen physicians that are very much pressured by whatever reports the adult children are giving. You know, mom’s leaving the pot on the stove, is a common one. You know, she’s having more falls at home. And I think that it probably sounds like the physician is feeling that pressure around the risks. And so it’s quite easy to say, yes, you know, I support that, you know, that she should be going to long- term care. And then we [the CCAC] come out and do the assessment, and then we might be telling the client and family, you know what? You’re capable, and we need to put other things in place, like get an automatic kettle, or, you know, and putting those things in. So I find that a bit of a… a bit of a challenge for sure. The LCO was also told that those conducting examinations of capacity to manage property under the MHA may face temptations to employ them in ways that address institutional pressures. The case of Re V provides an example of these dynamics. In this case, V’s physician was of the opinion that V could be discharged if there were financial resources available to support him. V had no financial means and did not want to apply for ODSP or other financial assistance: his physician thought that if he were found incapable of managing property, the PGT could apply for financial assistance on his behalf and V could be discharged. The physician had not examined V upon his admission to the facility, but had just assumed his incapacity to manage property at that time. The CCB overturned the physician’s finding of incapacity to manage property and admonished the attempt to use the PGT to force V to comply with the discharge plan. Finally, the LCO heard concerns that these examinations may be used as an “end run” around the requirements surrounding Capacity Assessments with respect to the management of property under the SDA. Jude Bursten, a patient rights advocate with the Psychiatric Patient Advocate Office (PPAO), reported that some physicians have requested that clients be admitted to a facility to force an examination of their capacity to manage property when these patients have exercised their right under the SDA to refuse an assessment. Since examinations under the MHA are of no cost, while Capacity Assessments involve a fee that may range from hundreds to thousands of dollars, there may be pressures to use the MHA provisions rather than those under the SDA. Capacity Assessments under the SDA are provided on a consumer choice model. In this model, the individual, his or her family, and/or the affected institution retains the responsibility for locating and paying for an appropriate Capacity Assessor. The Ministry of the Attorney General has provided thorough guidelines for SDA Capacity Assessments. Through the Capacity Assessment Office (CAO), it ensures minimum standards through education and ongoing training requirements. The CAO also maintains a list of designated Capacity Assessors who have met the requirements. However, it is the responsibility of individuals and service providers who wish for a Capacity Assessment to be conducted to locate an appropriate Capacity Assessor from the list and to fund the cost of the Assessment, a cost which may vary from hundreds to thousands of dollars, depending on the nature and complexity of the Assessment required. The CAO does make efforts to ensure that designated Capacity Assessors are available in regions across Ontario and will provide assistance to persons seeking to locate Capacity Assessors who are able to communicate in languages other than English. The particular assessment required cannot, by law, be completed by anyone other than a designated Capacity Assessor (that is, an assessment by a Capacity Assessor as a “letter of opinion”, for example regarding capacity to create a will or POA will not be covered). The person is able to self-request or family member requests, and the person will not refuse the Assessment. The individual requesting the Assessment meets the financial criteria to be eligible for financial assistance. The financial criteria are very restrictive, but would generally cover persons living on Ontario Disability Support Program payments, or an older adult whose income was restricted to Canada Pension Plan and Old Age Security payments. It should be kept in mind that where a guardian of property is appointed through a Capacity Assessment, the guardian can provide reimbursement for the costs of the Assessment from the incapable person’s funds if there is sufficient money to do so. The key strength of this model lies in the quality of the assessments that result from this screening, training and oversight regime. While the skill of Capacity Assessors of course varies, overall, stakeholders had confidence that there are meaningful standards associated with these important processes. The overriding concern is with the accessibility of Capacity Assessments. This concern was raised repeatedly throughout the consultations, with a number of barriers to access identified. Given that Capacity Assessments are necessary for both entry into guardianship and for exit, their accessibility is a matter of significant importance to families and to individuals affected by issues related to legal capacity. These barriers to access may result in pressures to gain entry to the MHA examinations described in the previous section. The cost of Capacity Assessments was seen as a significant barrier to access by many community organizations and service providers who work with populations affected by issues related to legal capacity. One of the barriers that I’ve seen from a financial capacity [assessment] is the cost. Making way for a Capacity Assessment. You know, when you’re mentioning it and it could be $400 for something, that really is, it’s a lot of money for people here. That’s one thing I’ve seen. There’s no consistency or standardisation on the ability to administer. And I know I’m stupid in this area but when I think about those kind of dilemmas, right, well, this person really could benefit from a competency assessment but it’s going to cost $2,000 to do it, why is that? Why is there that cost associated with something that might be… like, I can understand screening, screening, screening and then saying, yes, you meet the criteria to get a free competency assessment because if that’s the thing that’s preventing the person from getting the proper care, right, it doesn’t seem logical to me that someone should have to pay $2,000 to get a competency assessment when we’re trying to [improve] the person’s life and whatever. So, that… when you [another participant] were just talking about it I was thinking, well, that’s kind of crazy. [Second speaker] And it’s very prohibitive for some people. Even if they do want to have it done in advance and have their wishes condoned. But it’s, obviously, not everyone can fork over that cash. Specialized capacity assessments are also a costly procedure, leaving many concerned loved ones at a loss as to how they can best support the individual in question. Many people with an ABI [Acquired Brain Injury] are on Ontario Disability Support Program (ODSP) and their caregivers or concerned family/friends are not in any financial position to pay for an assessment.Having a subsidy, or provincially funded program for those who are on social assistance will ease the burden of the costly nature of the process. The LCO heard that accessibility is affected, not just by cost, but also by the lack of system navigation. Individuals are responsible for locating and selecting their own Assessors, based on the list that the CAO provides. This may be particularly difficult for individuals who are marginalized or low-income. I don’t know what other people’s experience is in areas other than Toronto, here there’s quite a lengthy Capacity Assessor list but everyone’s independent on that list. There’s no, sort of, coordination around it. It’s the client’s individual responsibility to contact the Assessors, schedule and, sort of, negotiate all that type of thing. And that has been quite difficult. That itself has been a barrier for a number of clients in my experience. Particularly if they require an interpreter to communicate. But even if not, having the ability to have even voicemail accessible to return calls back and forth, all of these things are quite difficult. And not knowing what the expectations are of the Capacity Assessor either. That’s been hard for our clients. [T]he process itself isn’t even that good, there’s no central number, you’re calling each Assessor, like some of them are good, some of them aren’t, also. And then also trying to find different languages and all of that kind of stuff, right, so before you even start, it’s quite a process, and then the billing itself is also, you have to figure that out for like maybe, who’s going to pay, they all want it differently, like it’s a lot of work, it’s a pain. Linguistic and cultural barriers may also affect the ability to identify the relevance of a Capacity Assessment and to navigate access to one. Particular concerns were raised for persons in remote communities, including Aboriginal communities. In smaller or more remote communities, there may be no Capacity Assessors, or no Capacity Assessor with the necessary expertise. As well, the nature of the process may not work well for individuals who are low-income, or for particular communities. In Thunder Bay we have a large northern community of Aboriginal communities and, again, that would be the same. No Assessor around there. The cost of flying in and out. But also the process is so bureaucratic. It’s too… it’s not user friendly, all this. So, it’s very difficult for a lot of the Aboriginal communities that, to understand what options they have and how to access those processes. How to get, you know, again, like, sometimes they don’t even have touch tone phones, you know, or they don’t even have a phone and voice message and all that to get a hold of a Capacity Assessor. And there’s no one to walk them through and assist them with that a lot of it. Finally, the LCO heard that there are other populations that may face specific barriers to accessing SDA Capacity Assessments. The attention of the LCO was drawn, for example, to the situation of Youth in Care who are transitioning to independence at the age of 18. For those transitioning youth who are living with acquired brain injuries, mental health disabilities or other condition that may affect decision-making abilities, there may be no clear mechanism or responsibility for triggering a Capacity Assessment at age 18: these youth may “fall through the cracks” in various systems. The LCO’s consultations revealed widespread confusion about the roles and operation of Ontario’s multiple mechanisms for assessing capacity. This was true for individuals and families, and it was also surprisingly common among service providers. Most service providers provide the majority of their services within one domain, and therefore with one type of assessment: interactions with the other mechanisms are not a daily occurrence, and so confusion may occur in these cases. The importance of service providers understanding the system cannot be underestimated. If they are not able to provide accurate information, they may unintentionally mislead individuals and families. In particular, participants in the consultation identified confusions between SDA Capacity Assessments for personal care and capacity evaluations under the HCCA regarding consent to admission to long-term care or for personal assistance services, and between MHA examinations of capacity to manage property and SDA Capacity Assessments regarding property. Especially at the CCACs we’ve noticed that there’s an understanding gap between, or rather even just, a language gap between the words assessment and evaluation. And people confusing the two or using the words interchangeably…. [Second speaker] Exactly, and one costs a lot of money and one is free. So, and people thinking that certain aspects, that the assessment provider, that also, that they can do an evaluation, which is not true at all. And vice versa. So, it is a, it’s a very blurred line that has been very difficult for us to, kind of, clearly point people towards a direction of, you know, as a care coordinator you can only perform an evaluation. If you want an assessment you must pay a Capacity Assessor to do this for you and it’s something that has been very challenging for us. There was some confusion expressed by health practitioners about who determines capacity for treatment. Some health practitioners were not confident that they knew how to assess the capacity of a patient to make treatment or other health decisions. Some thought that they were required to get a psychiatrist to assess capacity for treatment decision-making. A few health practitioners thought they would need to get a “Capacity Assessor” to perform this assessment. ACE and DDO lawyers have also dealt with cases where health practitioners providing services in long-term care homes have assumed that a person was incapable for treatment if that person had been determined by an “evaluator” (as defined in the HCCA) to be incapable for admission to long-term care. These health practitioners may not have understood that capacity is issue specific and that a person could be capable for some or all treatment decisions although determined incapable for the decision for admission. The parallel processes between assessments for property management under the MHA and the SDA are the source not only of confusion, but of practical difficulty for individuals who may at varying times fall within the scope of both systems. I know from my perspective, there’s interaction between the Mental Health Act and Substitute Decisions Act, but I think entanglement is probably a better word, is really complex, is very difficult to try to explain to our clinicians, and is very, results down the line in a lot of difficulties for the family, and trying to explain to clients, yes, because there are situations where the client is an inpatient for a psychiatric facility and yet has no right of review for financial incapacity under the Mental Health Act, and trying to explain how that could be possible is very difficult. Part of that I think comes from the fact that this financial incapacity piece has been embedded on the back of the Mental Health Act, completely seemingly separate from everything else that’s going on in the Substitute Decisions Act. So I think where that point of crossover is, where you sort of leave the realm of the Mental Health Act and enter the realm of the Substitute Decisions Act, there’s enhanced costs that come with it, right of refusal that comes with it. The fact that [unclear] raise obligations in costs associated with the assessments, is very challenging. Clinicians commented that part of the need for a separate process under the MHA was that the costliness and cumbersomeness of Capacity Assessments under the SDA make it too difficult to ensure that MHA patients have their basic finances protected or for them to regain control over their finances once legal capacity is regained. As rights advisers pointed out to the LCO, the vast majority of individuals in the mental health system are living in low-income, and not only can they not afford a Capacity Assessment, but may not have the most basic wherewithal, for example in terms of access to a telephone, to arrange one.185 One clinician commented that “essentially you almost want to encourage them to how to become an inpatient, to be able to be assessed, and that sounds like a really broken system”. I think the biggest issue is accessibility, so you have an outpatient client who isn’t doing that well, but even if you are able to see that as a clinician, there isn’t really accessible ways of getting that assessed in the community. So it’s kind of like you [another participant] were saying, it works well in an inpatient standpoint, but if you have an outpatient, it becomes very complicated, and I think also for families being able to navigate that, in the absence of some sort of clinician or case worker, that kind of help. This is perhaps a greater issue now than when the legislation was initially passed, because of the trend towards outpatient treatment. Many psychiatrists, rights advisers and clinicians pointed to the cumbersome processes for reassessment for persons who transition from inpatient to outpatient. The other thing that I’ve seen is very challenging from a client rights perspective or a patient rights perspective, is if the initial finding made as an inpatient, subsequently getting right of review to the CCB is exceedingly difficult, and we’re constantly, particularly if the client has been discharged and then readmitted, because they have remained under the statutory guardianship, they don’t have a MHA right of review, and for a lot of the clients, when I am giving the advice that what they have to do is get a new assessment, here’s a phone number for the PGT’s capacity office, I know that what I’m saying to them is, you will never have a CCB hearing about this. Being able to get an assessor and afford it, it’s not going to happen. The inability of psychiatrists to perform examinations of capacity to manage property with their outpatients is a shortcoming of capacity, decision making and guardianship legislation that negatively impacts people with mental illness and leads to system inefficiencies. CAMH recommends making amendments to the MHA and/or SDA to ensure that they work cooperatively to facilitate assessments of financial capacity by qualified practitioners, including psychiatrists, in the community. Amendments must include standardized guidelines for when and how to examine capacity in community settings and patients must have access to the same procedural rights they are afforded in inpatient settings. Capacity Assessors designated under the SDA must meet specified provincial requirements for ongoing training, as well as comply with the thorough Ministry of the Attorney General Guidelines for Conducting Assessments of Capacity. Under the MHA and HCCA, however, assessments are largely subject to the professional judgment of the practitioners who carry them out. In the LCO’s view, this results in a lack of clear standards for assessments under those two statutes. The SDA Guidelines do not apply to the examination of capacity to examine property under the MHA and guidelines for assessing capacity published by the relevant colleges focus on capacity to consent to treatment. The LCO’s research indicates that examinations to determine capacity to manage property performed by physicians in psychiatric facilities are relatively unregulated and under-analyzed. The LCO’s research did not uncover any policies, tools or training manuals specifically tailored to this type of assessment, although it is certainly possible that such materials have been developed for use within facilities. One area of misunderstanding or misapplication of the MHA is the effect of an existing POA on examinations. Section 54(6) dispenses with the requirement to make an examination where “the physician believes on reasonable grounds that the patient has a continuing power of attorney under that Act that provides for the management of the patient’s property”. Neither statute nor policy defines “reasonable grounds”. The LCO has heard that, when combined with misunderstandings of continuing powers of attorney for property, this lack of clarity may lead to a failure to determine whether the patient’s power of attorney for property actually covers all of her or his property, or is currently in effect. As a result, the safeguards against property loss intended by the MHA may not have effect. The individuals affected by this provision are not entitled to rights advice, exacerbating the issue. Because it is relatively much more common for older persons to prepare powers of attorney, this issue may have disproportionate impact on older adults. Neither the HCCA nor its regulations provide guidance for the conduct of capacity evaluations. Nor are there guidelines, official policies or training materials, or mandatory forms. Evaluations of capacity with respect to admission to long-term care are generally conducted with reference to the five question form highlighted earlier, a document that the courts have held does not on its own constitute a proper capacity evaluation. Some organizations have created guides to capacity evaluations which recommend a more thorough approach. The most comprehensive of these is Assessing Capacity for Admission to Long-Term Care Homes: A Training Manual for Evaluators, prepared by Jeffrey Cole and Noreen Dawe.188 There are also specialized tools, such as the Practical Guide to Capacity and Consent Law of Ontario for Health Practitioners Working with People with Alzheimer Disease by the Dementia Network of Ottawa,189 and the Communication Aid to Capacity Evaluation (CACE), developed by Alexandra Carling- Rowland.190 These guides are beneficial but incomplete solutions. Since none of these guides is endorsed by the legislation or regulations, evaluators are not required to use them. It is also unclear how much buy-in these guides have or how widely they are distributed. Another recurring theme in consultations was the confusion regarding the conduct of assessments of capacity to consent to treatment. As with capacity evaluations, training and guidance on assessments of capacity to consent to treatment are left to the health regulatory colleges, and these vary considerably from college to college. The abilities and level of confidence of health practitioners in carrying out assessments of capacity to consent to treatment therefore also varies widely. What I notice a lot is, there’s much confusion. I will have physicians who are adamant with me, that say the college of physicians and surgeons says they don’t assess. And when I remind them that we all assess as health care providers, there’s, they don’t seem to comprehend. Yes. They don’t. It’s a real struggle, because it’s a legal context as well, not a medical context, in terms of… you know, so some people will incorrectly, as well, in the medical field, use things [unclear] or those other kinds of medical-based screenings for cognitive function, rather than understanding the whole capacity and that assessment of it. So, from the very beginning, it’s a challenge. And then, I guess, the other side of that coin is, actually, health care providers standing up and saying there needs to be a capacity, a licensed or authorised capacity assessment. What we’re challenging, interpretations of the capacity, and they may be different across family and health care provider person. The lack of clear standards for assessments under the HCCA, together with shortfalls in training or education within some professions, creates confusion and anxiety around assessments under this Act, and a desire to defer the assessment elsewhere. I think, in part, that people find assessing capacity [under the HCCA] difficult, because there are no standards. So, it’s like, there’s somebody who they believe somehow [has] more expertise; let’s get that person, and so I think there’s, kind of, the reluctance, because they’re just not sure how to assess capacity. I think that’s new clinicians, perhaps, or even if it could be a nurse practitioner who’s proposing treatment. I mean, maybe the doctors are in a better position, but the other ones who are… they may be thinking, I’m not qualified enough, even though I’m the occupational therapist and I’m proposing that. So, I think it could be just some… they think that other person just knows more. That’s, I think, one reason. [Second speaker] I’ve seen this lots recently under several consultations, where you’re bringing in geri-psych because you think they have greater expertise, but it’s not an area in which they have the best expertise, and they don’t know the patient best of all. So, you know, they’re seeing the patient out of context and asking the wrong kinds of questions, and yet, because of that perception of superior expertise, everybody defers to that assessment, when the OT may well be the person who’s seen the patient for… the patient performing, and sees dramatic… in the case I’m thinking about, the team had seen a change over time, whereas the geri-psych person is seeing that person in the moment, right, and may think that’s where they normally function and it’s not the case. So it’s misapplication. As the Advocacy Centre for the Elderly and Dykeman Dewhirst O’Brien (DDO) commented in their paper commissioned for this project, confusion about capacity and consent under the HCCA among health practitioners is exacerbated by the significant reliance on materials from other jurisdictions or materials that include incomplete or misleading information. A further paper completed in 2016 by Judith Wahl, Mary Jane Dykeman and Tara Walton, which thoroughly reviewed tools, policies and practices related to health care consent and advance care planning, identified a range of significant limitations and legal errors in practice tools in these areas, and considered how endemic misunderstandings of the law could be most fruitfully addressed. 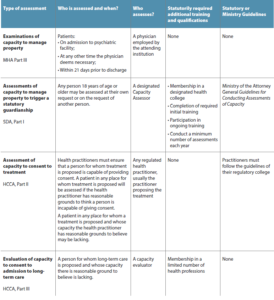 While the lack of clear standards and adequate training for assessments of capacity under the MHA and the HCCA are problematic in itself, given the challenges of assessing capacity and the vital importance of such assessments to the rights and wellbeing of those assessed, the lack of a consistent approach between different mechanisms for assessing capacity also adds to the confusion and complexity of the system. I was just going to say the other part of it is I’m not sure that, you know, a lawyer or a psychologist, an evaluator in the long-term care sector, the treatment assessor in terms of the health part, I’m not even sure that what they’re assessing is consistent, right? Are they asking the same questions and doing the same process? I don’t think so. It is true that there are significant differences between some of the domains and contexts in which assessments are carried out. However, the LCO cannot identify a principled reason for significant differences in the standards for Capacity Assessments regarding management of property under the SDA and examinations for capacity to manage property under the MHA. Further, there are certain common elements to assessments of capacity which are fundamental to the approach underlying the entire legislative regime and that ought to be clear and respected across all contexts and domains. Assessing legal capacity is challenging. Legal capacity is a nuanced concept in Ontario law. There is an inevitable tension between the concept of capacity as being contextual and fluctuating, and the need of the legal and health systems for clear thresholds. The importance of having a qualified, trained person administering these assessments cannot be stressed enough. The assessor should have sound knowledge of the policies, but also have detailed knowledge of, in this case, ABI. No two people with ABI are alike. The assessment challenges inherent in the concept are exacerbated by the great diversity of the populations that may be subject to assessment. For example, the nature of the decisional limitations of persons living with dementia, developmental disabilities, acquired brain injuries or various types of mental health disabilities will vary widely, and assessment strategies need to take into account these differences. The OBIA has pointed out the complexity of assessing persons with brain injury: these individuals may be able to answer questions at the time of assessment but not be able to put them into effect because of damage to the areas of the brain that process information, make decisions, filter information and initiate activities; as well, their abilities may fluctuate considerably. The OBIA suggested that the best way to assess a person with a brain injury is to assess them in their environment over time. As well, communication barriers or cultural differences may affect the assessment of legal capacity. Ontario’s population is extremely linguistically and culturally diverse. A number of consultees raised issues related to language barriers: without expert interpretation, the true abilities of an individual may not be manifest. Cultural differences may be subtle, and an assessor may not realize that a pattern of communication that seems to indicate a lack of legal capacity may simply be the manifestation of different cultural norms. Those who assess capacity may need additional training or supports to meaningfully address these challenges. Members of the Deaf community have raised concerns that communication barriers for persons who are culturally Deaf (such as a lack of skilled interpreters), and the low levels of literacy for this community arising from educational barriers, result in improper assessments of the legal capacity of members of this group. Just coming to the idea of assessments, I’ve noticed not having the appropriate accommodations on the assessments or the way assessments are done. It is really key to have those appropriate accommodations. I mean again if you don’t have that in place there is misrepresentation of what is written on that assessment or what is part of that assessment so I think it is really key before you even start any type of assessment is to look at those accommodations, what does that person need to do to do it successfully regardless of their hearing loss, interpreters, FM systems, a note taker ensuring that this person knows that they have the right to access that information and be able to have that assessment done correctly I think is key. Similarly, it may require some patience and skill to communicate with persons with aphasia arising from stroke or head injuries: failure of health practitioners to take the time to do this may result in the assumption of their incapacity and referral of decision-making to family members. In a focus group with persons with aphasia, participants expressed considerable personal pain at the tendency of health practitioners and others to assume their incapacity. The LCO also heard that particular attention should be paid to the challenges of assessing the decision-making abilities of youth: a developmentally informed approach is required, and this does not always fit neatly with understandings of legal capacity that assume an adult population. While some concerns were raised regarding the quality of some Capacity Assessors, particularly in those areas of the province where there is less choice, overall there was appreciation for the training and standards for SDA Capacity Assessments. The bulk of the concerns about assessments were focussed on other assessment processes, particularly assessments under the HCCA. I was going to say certainly the formal assessments done by designated Capacity Assessors you do have to pick and choose but I generally find that those Assessors are well versed in protecting autonomy, defending rights and at least those that I’ve experienced have gone out of their way to accommodate people … Outside of that process with evaluations and others there is I think a much wider range where people are some better trained than others and take more care than others but those processes seem to be much less organized and sometimes they are pretty perfunctory. Some don’t seem to understand that you can’t assess someone without the accommodations that they think are supposed to be assessed without support and that can affect things. It should be noted that Community Care Access Centres, which perform a significant number of capacity evaluations for consent to admission to long-term care, have undertaken a variety of initiatives to increase the skills of their staff and to institute appropriate procedural protections for those they evaluate. The process and tools used significantly vary even among the different CCACs, and CCACs are certainly not the only stakeholders carrying out capacity evaluations. For example, many hospitals have their own social workers or occupational therapists carrying out evaluations. The LCO has heard that many evaluations are still being carried out with only the “five questions” discussed above as a guide. CCAC staff have pointed to inconsistent application of the law, and to concerns that the law is not being appropriately attended to, whether because of institutional pressures or lack of understanding of the law. Concerns were widely raised that physicians and other health practitioners do not receive sufficient training and support regarding assessment of capacity to consent to treatment, so that these assessments may be inadequately completed, or not done at all. In their paper, Health Care Consent and Advance Care Planning, prepared for the LCO, ACE and DDO carried out a review of regulatory policies and publications, consent and advance care planning forms and systems and institutional policies and practices, as well as conducting focus groups with health practitioners, older adults and lawyers. [P]articipants stated that health practitioners generally do not adequately provide options and seek informed consent when seniors attend hospitals and long-term care homes. The participants noted that the power imbalance between physicians and seniors was significant, and that this affected the ability of seniors to ask appropriate questions related to the treatments proposed by health practitioners. Many of the participants shared anecdotes of their experiences with the health care system, a common theme of which was that physicians would not seek informed consent to treatment from either patients or SDMs. Given the implications of a determination of lack of legal capacity to make a decision, it is essential that individuals who are subject to assessments of capacity be provided with meaningful procedural protections. Within the HCCA, the provisions regarding rights information fulfill a crucial role. These provisions are intended to promote understanding of and access to the rights set out in the legislation, most centrally the right to challenge a finding of incapacity by application to the CCB. The LCO was told repeatedly that existing rights information mechanisms are insufficient to provide meaningful access to the rights under the legislation. I think that part of the problem is if you are not a patient in a psychiatric facility or you’re not somebody who’s on a community treatment order you have no assistance whatsoever from anybody. We know by anecdotal evidence and personal evidence that, for example, physicians or dentists in the community get people to sign consent for other people and they don’t give them their rights or rights information as they’re supposed to, or required by their college. And I think there needs to be some centralized clearinghouse for information for individuals to call so that they can find out exactly what their rights are because we know that the people that are supposedly telling them aren’t actually telling them and they’re not helping them. This is seen as a particularly widespread issue in long-term care homes, with the perception that this amounts to a systemic issue in this setting, one in which a significant percentage of individuals live with some form of dementia and therefore are at higher risk of not meeting the threshold for legal capacity to consent. Here in our facility it was a long-term care assessment. The person was found incapable to make that decision and the person applied for a hearing and the CCAC person came to our office and said, they applied for a hearing, I don’t know how they knew how to do that, or how they had the information that they could, but they did and now I don’t know what to do. And I was just, kind of, you know, you’re just, kind of, taken aback, going, if you made the assessment did you not give them that information? And what do you mean, you don’t know what to do now? I was just really shocked. And I can tell you from my own personal experience that long-term care, when they say someone is incapable, they don’t give them that information. They just go right to the person that they assume would be the power of attorney and request permission to do things. As well, rights information may be provided in a very cursory way, or without taking into account the needs of those receiving the information. For example, persons with visual disabilities may simply be provided with a written document, without any explanation. Linguistic barriers may not be addressed adequately, or at all. When someone doesn’t speak the language or read English that the doctor doesn’t always get a translator or to translate the treatment order or treatment plan for the client. So, he only has to go by what he’s being told to do. And I think that’s extremely unfair for anybody in Ontario, that because they don’t speak the language they don’t have the right to know what it is that has been taken away from them. Or they’re being told that they have to follow a plan but they don’t know what the plan is because they are unable to read it because it’s not in their language or it’s not being explained to them in their language because they haven’t received a translator. The LCO is troubled by these widespread reports, as they raise fundamental issues about the protection of basic rights. A health practitioner shall, in the circumstances and manner specified in the guidelines established by the governing body of the health practitioner’s profession, provide to persons found by the health practitioner to be incapable with respect to treatment such information about the consequences of the findings as is specified in the guidelines. There are 26 health regulatory colleges in Ontario, with responsibilities for setting and enforcing guidelines for the practice of health practitioners, providing ongoing training and education, and receiving complaints from the public. The health regulatory colleges oversee a wide range of professionals, including doctors, nurses, dentals, speech language pathologists, dental hygienists, dieticians, respiratory therapists, pharmacists, occupational therapists, and many others. All of these professionals are responsible for obtaining informed consent to treatment under the HCCA: all are therefore directly affected by legal capacity and decision-making laws. The responsibility of the health regulatory colleges to develop practice guidelines for their members allows for guidelines to be tailored to the particular skills, contexts and responsibilities of their members. However, it does also result in very wide variation in approaches, which causes challenges in the application of legal capacity laws. The health regulatory colleges differ widely in the content and specificity of their guidelines on rights information for persons found legally incapable of consenting to treatment. This wide variation leads to inconsistent rights protections, and therefore a lack of equal treatment for persons who are often in an extremely vulnerable situation. Given this context, it is not surprising that health practitioners differ widely in the nature and amount of education and training that they receive on issues related to legal capacity and consent. Practitioners may have only a limited understanding of issues related to capacity and consent in general, and even less understanding of the procedural rights available to individuals who are found to lack capacity to consent. to the CCB for directions regarding the prior expressed wishes of an individual, and applications to the CCB for permission to depart from the prior expressed wishes of an individual. The advocate was required to notify the individual of the decision or determination that had been made with respect to her or him; explain the significance of the decision or determination in a way that took into account the special needs of that person; and explain the rights that the individual had in that circumstance, such as a right to challenge the decision or determination. It is trite but worth emphasizing that vulnerable persons require enhanced systems in place to protect their rights. In the context of psychiatric patients, the requirement of independent rights advice under the MHA and HCCA plays a significant role in protecting the rights of individuals who are involuntarily detained, found incapable in various respects or are subject to a community treatment order. Rights advisors are essential in assisting patients who are cognitively impaired with following up on their wishes to challenge findings of incapacity by completing and filing the application to the CCB, by connecting them with counsel specialized in the area and by completing applications to Legal Aid Ontario to secure funding for counsel. Interestingly, community treatment order substitute decision-makers, also receive mandatory rights advice. There is no independent rights advice regime in place respecting findings of incapacity outside of the MHA context. In these situations the rights advice is expected to be provided by the assessor or evaluator or simply left to the patient. Outside of the context of mandatory independent rights advice, persons who disagree with incapacity findings generally fail to challenge them. There is no principled basis for the provision of independent rights advice in some but not all situations where an individual is found to be incapable with the result that they face significant infringements of their autonomy or liberty. Accordingly, the MHLC recommends legislative changes to require independent rights advice in all situations where an individual is found incapable with respect to treatment, managing property or admission to long- term care. The LCO has heard some concerns related to a lack of clarity and procedural protections regarding the authority of SDMs to make decisions about very serious matters, such as detention in a long-term care home or retirement home. Many of these facilities include secure units, intended to protect the safety of residents whose disabilities are such that they are at risk of getting lost or otherwise coming to harm. While long-term detention may well be necessary for safety of some vulnerable individuals, such detention does raise fundamental liberty and autonomy interests, and so requires careful balancing of rights. As the Victorian Law Commission commented in dealing with these issues, “Because liberty is a value of paramount importance in our community, it is strongly arguable that actions involving total loss of liberty should be authorised by a process that involves appropriate checks and balances”. The statutory provisions regarding detention of persons lacking capacity appear to be incomplete. There is no clear authority under either the SDA or the HCCA for a guardian of the person, power of attorney for personal care or HCCA appointee to consent to ongoing detention in a long-term care home or retirement home. The exception is in those rare circumstances where a “Ulysses Clause”, as enabled under section 50(2) of the SDA, has been inserted in the POAPC or court order. A “Ulysses Clause” may authorize “the attorney and other persons under the direction of the attorney to use force that is necessary and reasonable in the circumstances to take the grantor to any place for care or treatment, to admit the grantor to that place and to detain and restrain the grantor in that place during the care or treatment”. The lack of consistency and clarity raises concerns and challenges for hospitals, long- term care homes, and retirement homes that are currently detaining individuals. The more important consequence, however, is for individuals who may be detained. The lack of meaningful safeguards, consistent practices, provincial rules and procedural rights puts their fundamental rights in jeopardy. The nature of the procedural rights and safeguards that should attend any such detention, including rights to hearing, regular reviews and access to rights advice. As discussed in Chapter 4, debates about legal capacity and how it is defined are often described in terms of competing principles of autonomy and “beneficence” or safety. The tension between these principles was discussed at length in the LCO’s Frameworks and earlier in this Final Report. In some ways, this area of the law can be understood as a mechanism for balancing and fulfilling the principles. The Frameworks highlight the challenges for persons with disabilities and older persons of navigating processes that are complicated or multi-layered, and the importance of providing adequate navigational supports for these kinds of processes, or of simplifying those processes. The Frameworks emphasize the importance of simplifying complex systems, to make them more transparent and accessible, and providing supports or advocacy services to assist with navigation. The Frameworks also emphasize the profound importance of ensuring that persons with disabilities and older persons are meaningfully informed about their rights, and that the processes in place are such as to enable these individuals to pursue these rights. Providing the information and the processes necessary to access rights is itself essential to promoting autonomy and dignity for these groups; as well, without such processes, individuals will be unable to achieve the principles, even if the substance of the legislation complies with those principles. These considerations underscore the gravity of the kind of concerns that have been voiced about the adequacy of rights information under the current regime. Most seriously, there is no practical guarantee that individuals who are found to lack legal capacity – and thus to be unable to make decisions for themselves – under the HCCA are ever informed that they have rights to challenge those decisions, or even that such a determination has been made and what its effect is. This is a clear and serious shortfall in the current law. The LCO’s research and consultations have highlighted the enormous gap that may exist between the abstract concept of legal capacity as described in the statute and the everyday understanding and implementation of the law by individuals, including professionals, families and those directly affected. Everyday practical needs and popular “common-sense” understandings of the law drive much of its current implementation. Because this area of the law relies so much on the efforts and understandings of private individuals, the gap between the statute and lived experience is wide, and is a challenge for law reform. There is, as this Chapter documents, particular concern about the lack of adequate training and education for those professionals carrying out assessments of capacity to consent to treatment and evaluations of capacity to consent to admission to long-term care and to consent to personal assistance services. The lack of clear standards and consistent delivery mechanisms for professional training and education puts at risk the autonomy, security, and dignity of those individuals who lack or may lack legal capacity. The Frameworks emphasize the importance of lived experience and remind us that the experiences and needs of persons who may be affected by this area of the law will vary significantly. As a result, it is important in assessing legal capacity that differences related to gender, language, culture, disability, geographic location and other factors be taken into account, to the extent possible. There is no single right approach to these issues: any regime will raise challenges. Furthermore, many consultees identified positive aspects of the current system, especially in its intentions. Therefore, rather than recommending radical reform of Ontario’s capacity assessment systems, the LCO has attempted to identify practical solutions that will maintain and hopefully build on the strengths of the current approach and reduce some of the negative side effects. Of greatest concern to the LCO are issues related to the quality of certain types of assessments and to gaps in the provision of fundamental procedural rights to all individuals who are assessed. These topics are discussed at length earlier in this Chapter. The recommendations that follow are primarily directed at these issues. The LCO addresses related questions regarding access to information, training and education about assessment and procedural rights elsewhere in this Final Report. At this time, the LCO is recommending incremental improvements to Ontario’s capacity assessment regime. However, the LCO believes that the results of these improvements should be carefully monitored. If significant improvement is not evident within a reasonable period of time, the LCO believes that government should consider a fundamental redesign of assessment under the HCCA to strengthen the implementation of this area of the law, and to ensure that those affected have appropriate access to basic procedural protections. The issues identified earlier in this Chapter are urgent issues. They raise significant liberty interests, affect a large number of Ontarians, and are likely to grow over time, given current demographic trends. In these circumstances, it is essential that there be a clear statutory regime that provides a legal foundation that protects the liberty interests of very vulnerable Ontarians, ensures that adequate safeguards and procedural protections are in place, and authorizes detention only in appropriate circumstances. This regime would both protect rights and provide legal clarity and certainty to the family members, health care professionals and institutions involved in these very serious situations. e) include a strategy for data collection, public reporting, and monitoring and evaluation. It is implicit in Ontario’s legislation that substitute decision-making is required only where there is both a lack of legal capacity and a need for a decision to be made. a) a specific treatment or service is in contemplation and b) there are reasonable grounds to question the presumption of capacity to provide consent. In other words, HCCA assessments are only triggered where there is a clear, specific and present need. Routine screening of whole classes of individuals cannot and should not be endorsed, as this prejudges an individual’s capacity based on class membership. For example, it is incorrect to assume that all intellectually disabled persons must be incapable by virtue of their disability. It is incorrect to assume that a diagnosis of a severe psychiatric disorder like schizophrenia renders the person unable to meet his or her personal care or financial needs. Form C for Capacity Assessors requires the Assessor to identify a cause for the Assessment, such as “information about inability to manage personal care” or “information about person potentially or actually endangering his or her well-being or safety”. Nevertheless, it appears that in practice more direction is required to ensure protection of people’s rights. Given that ARCH has observed the use of capacity assessments where less restrictive measures may have been adequate, we are concerned that the LCO’s recommendation to increase access to capacity assessments may have an unintended detrimental impact by subjecting even more persons with disabilities who have capacity issues to unnecessary capacity assessments. If this occurs, more people may be subject to substitute decision-making where less restrictive measures may have sufficed. Given the concerns raised during the consultations about misuse of assessments of capacity, the LCO believes that the purposes or appropriate triggers for an Assessment of Capacity should be clarified. Chapter III.E.1 highlighted the value of clarifying the purposes of the legislation in this area in promoting appropriate application: this is an example of where greater clarity regarding purpose could reduce misuse. The LCO notes that Alberta legislation requires that there be a valid cause for concern in order to necessitate a capacity assessment with respect to property or personal care, that is, an event that puts the individual or others at risk and that seems to be caused by an inability to make decisions.223 Assessors must know the reason that a capacity assessment has been requested and familiarize themselves with the circumstances leading to the request.224 The LCO believes that this stronger language, which pairs both the inability to make decisions and a need for the type of intervention associated with guardianship, provides a helpful approach that can be incorporated in Ontario. In keeping with Recommendation 1, a clear statement in the SDA of the appropriate purposes for Capacity Assessment would be valuable. As well, because forms tend to shape practice, a review of the forms associated with Capacity Assessments would be useful. For example, it was suggested to the LCO that the language included in Form C for Capacity Assessors created under Regulation 460/05, be strengthened. The MHA takes yet another approach to the triggering of an assessment. It actively requires an examination of the capacity to manage property of all persons admitted to a psychiatric facility, unless the person’s property is already under someone else’s management through a guardianship for property under the SDA or a continuing power of attorney for property. As has been noted elsewhere, these provisions are intended to prevent significant disruption to the lives of those admitted to a psychiatric facility due to an inability to manage property during this time. However, the mandatory examination for all those admitted is unusual in the context of the overall legislative scheme, in that it appears to reverse the presumption of capacity for this specific group, subjecting all members of this group to an examination. That is, there appears to be a presumptive conflation of the status of having a psychiatric disability with lack of legal capacity to manage property and with a need for guardianship. While it may be appropriate to give consideration in all cases to whether an examination is necessary, it may be excessive to require an examination in all cases. Assessments of capacity are intrusive processes with potentially significant implications for the affected individual’s rights. The LCO believes that such assessments should take place only where necessary for the interests of the individual, and not on the basis of presumptions about particular classes of individuals. The LCO believes that examinations of capacity to examine property under the MHA should require some trigger: the current requirements are inconsistent with a presumption of capacity. However, to avoid creating a disincentive to assistance for individuals who do require an SDM while in a psychiatric facility in order to avoid unnecessary loss of property, the bar should not be set too high. Physicians should not, for example, be required to investigate the financial arrangements of the individual. Under the circumstances, the LCO recommends that the trigger for an assessment under the MHA be harmonized with that under the HCCA: that is, adopting the language of “reasonable grounds” for belief that there is a lack of legal capacity to manage property. This provides physicians contemplating an examination under the MHA with a test that is familiar to them from their general practice, and avoids adding to the complexity of the legislative scheme. As well, in implementing Recommendation 17, with respect to the creation of Guidelines for examinations for capacity under the MHA, guidance should be provided on how physicians should understand and identify where reasonable grounds exist. There was significant discussion of section 54(6) of the MHA in the submissions following the release of the Interim Report. This provision specifies that there is no requirement for an examination to manage property upon admission if the physician believes on reasonable grounds that there is a continuing power of attorney for property. As was discussed earlier in the Chapter, problems arise under this section where there is no careful review of the power of attorney, so that the examination may be dispensed with on the basis of a document that is not applicable in the circumstances or does not cover all of the person’s property. Some advocated for a clarification in the statute to address this issue. Specifically, it was argued that it should be clear that prior to dispensing with an examination of capacity to manage property because of the existence of a power of attorney, there must be a review of the scope and requirements of that power of attorney. If the power of attorney is not applicable or does not cover all of the property, the examination should proceed. Others suggested that the provisions of section 54(6) with respect to powers of attorney be removed: the result would be that where a patient is found to lack capacity to manage property and a power of attorney exists, the power of attorney would be forwarded to the Public Guardian and Trustee along with the declaration of incapacity, and if appropriate, the statutory guardianship would then be terminated. In this way, the patient would retain the benefits of rights advice and the PGT would be responsible for examining the power of attorney document. The LCO believes that the first option is the more practical approach in the circumstances. The disadvantage to the second approach is that it would result in additional layers of bureaucracy and legal complexity: a statutory guardianship would be created, only in order for it to be shortly thereafter terminated. This approach would also create some incentive for informal “work arounds” in such a system, as well as undermining the essential purpose of Part III of the MHA of providing speedy invocation of financial decision-making for patients where warranted. Finally, in Recommendation 40, the LCO has proposed that the Government of Ontario work towards replacing statutory guardianship with adjudication for all guardianships: an approach that broadened statutory guardianship would be inconsistent with that Recommendation. As is clear from the previous discussions, Capacity Assessments by designated Capacity Assessors are vital both for entering guardianship where necessary, and for exiting it where it is no longer appropriate. Access to Capacity Assessments is therefore closely connected to the preservation of personal security for individuals and to their autonomy. Lack of access to Capacity Assessments may compromise fundamental rights. It is also clear that some individuals may face considerable challenges in accessing Capacity Assessments: these individuals will tend to be the most vulnerable individuals, such as persons living in low-income, those with low literacy levels or who speak English as a second language, those living in remote communities, persons from various cultural communities, and Aboriginal persons. The Capacity Assessment Office does important work in assisting individuals to access information and in administering the fund for those who meet the income criteria. The LCO has concluded, however, that additional efforts are required to ensure that vulnerable groups are not disadvantaged in accessing their rights. 14: The Government of Ontario develop and implement a strategy for improving access to Capacity Assessments under the Substitute Decisions Act, 1992. Such a strategy would consider how to remove informational, navigational, communication and other barriers for persons in remote and First Nation communities; newcomer communities; youth in transition from care; persons facing communications barriers, including among others those who are Deaf, deafened or hard of hearing and persons for whom English or French is a subsequent language; low-income individuals; and others identiﬁed as facing barriers. The College proposes that the Ministry … consider adding CASLPO as one of the designated regulatory colleges. Speech language pathologists have the education in the capacity evaluation process, the knowledge and skills to overcome a communication barrier, and in-depth knowledge of cognitive communication disorders and how these impact decision-making. Speech-language pathologists can use their skills to determine impartially and with greater certainty, whether or not an individual living with a communication barrier has the capacity to make decisions regarding property and personal care. As was described above, the LCO heard repeated concerns about the cumbersome process for re-assessment of persons under the MHA who transition from in-patient to out-patient. It may be difficult for persons found incapable with respect to property under the MHA to access a new assessment under the SDA process once they are discharged. As a result, they may have no viable means of exiting from statutory guardianship. Mental health clinicians pointed out to the LCO that it did not seem to make sense that psychiatrists who could evaluate capacity to manage property in one setting were unable to do so for the same client in another setting. The Centre for Addiction and Mental Health (CAMH) proposed to the LCO that psychiatrists who conducted capacity examinations under the MHA be provided with the opportunities to assess or re-assess persons defined as ‘outpatients’ under the MHA. These outpatients would have the same rights and protections as persons currently examined as inpatients. This could be framed broadly, or could be restricted to re-assessments of individuals who were found incapable under the MHA provisions and who are now in the community. This is an interesting proposal, though subject to concerns about extending the reach of the MHA, which is perceived as a relatively coercive instrument, into community settings. Another suggestion was to examine whether this issue could be addressed through amendments to the SDA process – for example, by creating a special exception or designation under the qualifications for Capacity Assessors. The relationship between the MHA and SDA is complex, as is the question of the appropriate reach of the MHA into the community. However, the underlying goal, of ensuring that mental health patients have access to the assessments they need with respect to capacity to manage property, is an important one. The LCO believes that there is merit in considering this issue further. As was discussed above, while the SDA provides clear and comprehensive guidance for Capacity Assessments through the Guidelines for Conducting Assessments of Capacity, no such guidance exists for assessments of capacity under the MHA or HCCA. Rather, this role is left to the discretion of the multiple health regulatory colleges, which vary widely in the extent and content of the guidance that they provide. It is certainly true that there may be appropriate differences depending on the domain or the particular type of treatment for which consent is being sought, the fundamental nature of an assessment of capacity and the principles which underlie it are, or should be, consistent. The LCO believes that there are basic rights accruing to persons under assessment that are not, or should not be, simply a matter of professional judgment, no matter how well-intentioned or implemented. The LCO heard repeatedly that the lack of clear guidance contributes not only to confusion but to shortfalls in the quality of assessments of capacity, particularly assessments for the purposes of treatment or admission to long-term care under the HCCA. The LCO therefore concludes that official Guidelines should be developed for assessments under the HCCA, parallel to those existing under the SDA. This recommendation received strong and consistent support in the feedback to the Interim Report, from a wide range of stakeholders. Similarly, official Guidelines should be developed for examinations for capacity to manage property under the Mental Health Act. To the degree possible, these Guidelines should be harmonized with those under the SDA, except where account must be taken of the differing context and procedural rights associated with these assessments. In accordance with Recommendations 12 and 13, Guidelines should include an explanation of the trigger for an examination of capacity in this context and how it should be applied, and guidance on the reasonable steps that a physician should take in those cases where a power of attorney for property may exist. 16: The Government of Ontario create oﬃcial Guidelines for assessments of capacity under the Health Care Consent Act, 1996, incorporating basic principles, procedural rights, and guidance for appropriate assessments of particular populations, including the provision of accommodation. 17: The Government of Ontario create oﬃcial Guidelines for examinations of capacity to manage property under Part III of the Mental Health Act, including in addition to matters listed in Recommendation 16, guidance on the appropriate application of section 54(6). The LCO takes very seriously the widespread complaints regarding the shortfall in the provision of meaningful notification, information and advice to persons found legally incapable under the HCCA. Failures to provide this type of support to persons found legally incapable, who by their nature and circumstances will have difficulties in accessing and enforcing rights, amount to a significant violation of the most basic procedural rights. There is a real risk that individuals are having their fundamental right to make decisions for themselves removed unnecessarily or inappropriately. As was noted earlier in this Chapter, many stakeholders recommended an expansion of the rights advice function that currently exists under the MHA to at least some of the situations under the HCCA where there are significant changes to legal status. These stakeholders felt that the rights information model under the HCCA is insufficiently rigorous to provide minimum due process to individuals who are found incapable under that statute, and that these individuals therefore have insufficient meaningful access to their statutory rights. The LCO has considered the proposals to expand the provision of rights advice beyond the MHA. The rights advice approach provides independent and expert information and advice to persons whose rights are significantly at stake and who are particularly vulnerable. Overall, Ontario’s rights advice program under the MHA is well regarded, and is considered a vital element of the province’s mental health system. The LCO agrees that the current HCCA rights information model has significant shortcomings and that the rights of persons found incapable under the HCCA are insufficiently protected. Nevertheless, the LCO has reluctantly concluded that the full and immediate expansion of rights advice to all those found legally incapable under the HCCA is not a viable approach, for reasons both of cost and practicality. For example, looking only at the long-term care sector, Ontario has over 630 long-term care homes, with close to 80,000 beds;226 just over three-quarters of the residents have some level of cognitive impairment.227 To meet the needs for information and advice through independent rights advisers would be not only expensive, it would be logistically very difficult. Considerable efforts were put into the implementation of the Advocacy Act: while there were multiple reasons for that legislation’s short history, the difficulty of the endeavour was obvious, and the LCO does not believe that an attempt to resurrect this approach would be the most effective in the current demographic, social and economic environment. As an alternative, the LCO has focussed its immediate recommendations on strengthening the existing rights information regime. As a first step, the LCO believes it is essential to clarify and standardize the requirements for rights information, so that persons found to lack legal capacity consistently receive the same basic information about their status, its effect and their recourse. Standardization will also help to reduce the confusion of health practitioners about how to carry out this important responsibility. While there are variances between the contexts in which the various health professions assess legal capacity and provide rights information, the LCO believes that there are certain fundamental procedural rights to which all persons found to lack capacity should have access. The LCO believes that it is the role of government, in these circumstances, to provide consistent standards for fundamental procedural protections for persons whose right to self-determination is being removed. Once clear and effective common standards have been established, the LCO’s recommendations regarding education, training and oversight may be helpfully employed to promote the effective application of these standards. As a further step, ensuring standard documentation regarding the implementation of these procedural steps will not only encourage health practitioners to carry them out consistently, but will enable more general monitoring of the implementation, so that the effectiveness of reforms can be evaluated and further steps designed as necessary. iii. the health practitioner provides the individual with information or referrals regarding the means of pursuing an application to the Consent and Capacity Board to challenge the ﬁnding of incapacity. b) Consistent with Recommendations 57 and 58, the health regulatory colleges strengthen their role of supporting and educating their members about how to meet these minimum standards through guidelines and professional education as appropriate. c) To assist in the implementation of this Recommendation, the Ontario Government amend the Health Care Consent Act, 1996 to require health practitioners and Capacity Evaluators, upon a ﬁnding of incapacity, to complete a simple regulated form, analogous to Form 33 “Notice to Patient” under the Mental Health Act, which would indicate the requirements for informed consent and rights information, and the practitioner’s conﬁrmation that these requirements had been adhered to. The LCO believes that the implementation of the above recommendation will improve the implementation of rights information. It is important to recognize, however, the inherent shortcomings in a rights information model. This model requires health practitioners to provide information about legal and procedural rights, a subject which is not at the core of their expertise, and to do so in situations where they themselves have just determined that the individual does not have legal capacity and where a challenge to that finding would involve them in proceedings before the CCB. There are unavoidable challenges to access to justice and due process built into a rights information model. Access to independent and expert advice is clearly preferable. This was reinforced through the feedback to the Interim Report, in which multiple stakeholders emphasized the built-in limitations of a rights information model, and advocated for an extension of independent and expert advice about rights to a wider range of situations and populations. While a full rights advice model, in which independent and expert advice is provided to every individual every time a finding of incapacity is made with respect to treatment or long-term care, is untenable, as was discussed above, there may be means of providing something short of this, but that still advances rights for affected individuals. The Independent Mental Capacity Advocates of England and Wales provide an example of an advocacy program that is highly targeted to the most serious situations and the most vulnerable individuals. Under the Mental Capacity Act 2005, the Independent Mental Capacity Advocacy (IMCA) service is responsible for helping “particularly vulnerable people who lack the capacity to make important decisions about serious medical treatment and changes of accommodation, and who have no family or friends that it would be appropriate to consult about those decisions”.228 An IMCA must be involved with a person who lacks legal capacity and has no one to support them, whenever a serious medical treatment is proposed, or long-term residential accommodation is under contemplation. In identifying groups or situations where an expansion of rights advice would be most beneficial, responses to the Interim Report consistently identified capacity evaluations for consent to admission to long-term care as a priority. These evaluations are potentially major turning points in the life of those evaluated, often resulting in a transition from life in the community to residence in long-term care. Unlike Capacity Assessments under the SDA or examinations for capacity to manage property, they are attended by relatively sparse rights protections, and capacity evaluators themselves are not subject to the same types of training and oversight as SDA Capacity Assessors. The challenge in applying a rights advice model to capacity evaluations is the diversity of the settings in which these take place, and of the professionals and institutions responsible for undertaking them. As well, the number of capacity evaluations carried out each year is very large, and with current demographic trends, that number is likely to grow. Nevertheless, the LCO agrees that capacity evaluations are the correct starting point for any expansion of independent and expert information about rights. Because of the potential cost and complexity of developing effective means for providing expert and independent information about rights, pilot projects can be a useful approach. Some stakeholders pointed to the potential of partnerships between the justice sector and health institutions in developing pilot projects and, eventually, models for independent and expert advice about rights in health care settings. One example of such partnerships is medico-legal partnerships (MLPs) or what are sometimes call Health Justice partnerships. These are common in the United States, and have recently been gaining increasing profile in Ontario, as part of a broader exploration of multidisciplinary approaches to legal services. Health Justice partnerships are based on an acknowledgement of the multifaceted interrelationship between legal needs and health problems. They adopt a multidisciplinary model that integrates “access to legal services as a vital component of health care”.229 These partnerships have formalized a “culture of advocacy” in the clinical context by dealing with a range of legal needs which have been shown to affect health and well- being, including income and insurance issues, housing and utilities, education and employment, legal status, family law, and capacity and guardianship issues. Generally speaking, Health Justice partnerships involve multidisciplinary health teams (typically made up of health care providers, legal aid and/or pro bono lawyers, social workers and law students) that collaborate to “identify root causes of problems that generate needs, understand broader context in which legal needs arise, and work proactively towards disrupting harmful tendencies of the system”. By leveraging the resources of community partners such as legal aid agencies, law schools, pro bono law firms, hospitals, health centres, medical schools and residency programs to identify, triage and resolve health-harming legal issues, and embedding the referral system within the existing health care infrastructure and medical consultation process, the cost associated with providing patient-clients access to legal assistance is minimized. There are a number of Health Justice partnerships currently operating in Ontario. Pro Bono Law Ontario (PBLO) has established such partnerships within a number of hospitals, including at the Hospital for Sick Children, the Children’s Hospital of Eastern Ontario in Ottawa, the Holland Bloorview Kids Rehabilitation Hospital, and McMaster Children’s Hospital. ARCH Disability Law Centre and St. Michael’s Family Health Team have partnered to tackle the legal dimensions of patient health and poverty law issues, in an approach based on a community development model and a disability rights framework. Various other clinics have joined this initiative, which provides legal services to patient- clients, legal education to health care professionals, and leadership on systemic advocacy and law reform. Legal Aid Ontario provides funding. Once the current pilot is complete, the partnership is expected to expand to five other Family Health Team sites. A central challenge, however, in adapting these types of initiatives to strengthen rights protection for persons lacking legal capacity in the context of consent to treatment and admission to long-term care, is that this context requires rights information or advice to challenge a health professional’s decision or action. Unless patients explicitly request a referral to the triage lawyer, health professionals bear the burden of flagging legal issues. In some circumstances, this could create the perception or the reality of a conflict of interest. Further thought would be required to identify means of addressing this shortcoming to adapt the Health Justice Partnership model to the particular needs of this context. The provision of clear minimum standards for rights information is an important first step in strengthening these provisions of the HCCA, and together with efforts to improve training and education among health practitioners, as recommended in Chapter 10, should result in some improvement in this area. However, given the systemic nature of the concerns raised and the challenges that families and individuals face in identifying where there has been a shortfall in rights information and in addressing such gaps, the LCO believes that system wide attention to the issue is also necessary to ensure basic procedural rights. As a further step to assist in regularizing and improving the quality of requirements related to capacity, consent and rights information under the HCCA, the LCO considered recommending a form of systemic oversight of the implementation of these provisions. For example, in its 2010 paper commissioned for the LCO’s project on The Law as It Affects Older Adults, the Advocacy Centre for the Elderly (ACE) recommended the creation of a Health Care Commission, intended to address complaints by residents of long-term care homes about lack of knowledge of their rights and a lack of accessible mechanisms for enforcing those rights. The Health Care Commission, in the vision of ACE, would be similar in some ways to the Office of the Provincial Advocate for Children and Youth: it would be independent, and would carry out both individual and systemic advocacy. The LCO has concluded that it would be more efficient and potentially more effective to integrate monitoring and oversight related to legal capacity and consent into existing mechanisms related to health care and long-term care. These sectors are already highly fragmented, with multiple institutions and stakeholders providing education and training, oversight and quality control. Existing mechanisms and institutions that could fulfil this role are identified below. Assessments of capacity under the HCCA take place in health care settings, and are in many ways inseparable from Ontario’s broader context for providing health and long- term care. However, these assessments are, fundamentally, determinations about legal rights to self-determination. In monitoring and seeking to improve the quality of capacity assessments (and thereby, in implementing the Recommendations set out below), it is essential that these institutions incorporate into their understandings of quality a central focus on patients as bearers of rights, and on compliance with the law by health practitioners and health institutions. Institutions may find it valuable to partner with the justice sector in developing mechanisms for more meaningfully monitoring and overseeing consent and capacity law within their mandate. b) promote approaches to quality that include respect for patient autonomy, a thorough understanding of the legal foundations of capacity and consent, and the promotion of patient rights. Persons living in long-term care have distinct and significant challenges in accessing legal rights. The nature of the setting is in many ways removed from the broader community. As well, long-term care residents are increasingly persons with very significant disabilities that may affect their abilities to understand and assert their rights. Rights protection mechanisms that may adequately address the needs of persons living in the broader community may be insufficient to provide meaningful assistance to this population. This issue was considered at length in a paper prepared for the LCO by the Advocacy Centre for the Elderly in 2010.238 The long-term care home sector incorporates a number of specific oversight, monitoring and complaints mechanisms intended to address, at least in part, the very significant challenges faced by residents of long-term care homes in protecting and enforcing their rights. The Lonng-Term Care Homes Act, 2007 (LTCHA) includes a Bill of Rights that directly addresses many issues related to legal capacity, decision-making and consent. To manage his or her own financial affairs unless the resident lacks the legal capacity to do so. The LTCHA clearly articulates the rights of residents of long-term care homes regarding the right to make their own decisions where possible, and for meaningful processes with respect to consent to treatment and care. The LCO believes that these mechanisms for monitoring and quality improvement can and should be mobilized to strengthen the ability of legally capable residents to make decisions for themselves, and for all residents to exercise their procedural rights related to capacity and consent. c) developing a thorough and speciﬁc focus on issues related to consent, capacity and decision-making in their staff training. The LHSIA indicates that the LHINs are expected to undertake efforts to improve the quality of health services, as well as the experience of patients and families who engage with the health care system. LHINs have the power to audit service providers within their network. They may also require them to provide reports, plans or financial information necessary for undertaking such a review.245 Specifically, section 22 of the LHSIA enables a LHIN to require any health service provider to whom the network provides or proposes to provide funding, or any other prescribed entity or person to provide to it plans, reports, financial statements or other information. LHINs may disclose the information gathered in this manner to the Minister or to the Ontario Health Quality Council. LHINs also have a responsibility to evaluate, monitor and report on and be accountable to the Minister for the performance of the local health system and its health services. The LCO believes that the vital role that LHINs play in setting policy goals, service standards and quality indicators makes them well-placed to promote, support and monitor improvements in the quality of assessments of capacity under the HCCA and the provision of rights information. Existing commitments to improving the patient experience, informing people and patients, and improving quality of care are aligned with this objective. c) support the provision of information and resources to substitute decision- makers regarding their roles and responsibilities under the Health Care Consent Act, 1996. The SIPDDA provides a legislative framework for the delivery of community-based services and supports, and for the provision of direct funding to individuals with developmental disabilities and their families. It includes a wide range of services and supports, including person-directed planning, residential services and supports, professional services, supports for community participation, and support for the activities of daily living. The SIPDDA establishes minimum standards with which service providers and community agencies must comply. Enforcement of these minimum standards takes place through a variety of mechanisms, including mandatory reporting requirements and inspections. The Quality Assurance Measures regulation under the SIPDDA includes requirements that agencies “promote social inclusion, individual choice, independence and rights”, principles that may inform how agencies support persons with developmental disabilities in their decision-making. Centrally, every service agency and application entity must address the “promotion of social inclusion, individual choice, independence and rights” in their policies and procedures and in the development of individual support plans of persons with developmental disabilities. Service agencies must also develop an annually-reviewed individual support plan that addresses that person’s “goals, preferences and needs”. 23: The Ministry of Community and Social Services consider whether, within its oversight functions under the Supports and Services to Promote the Social Inclusion of Persons with Developmental Disabilities Act, 2008 there are ways in which it can support and encourage the use of positive and autonomy- enhancing approaches to decision-making. b) should signiﬁcant improvement not be apparent, undertake more wide- ranging initiatives. Because legal capacity is the central organizing concept of this area of the law, how we assess legal capacity is foundational to the ability of the law to achieve its goals. And because legal capacity, decision-making and guardianship law addresses issues of fundamental rights, the success of our approaches to assessing legal capacity has a profound effect on the rights of those affected. Ontario has multiple interconnected systems for assessing legal capacity. Ontario’s nuanced approach to the concept of legal capacity, described in Chapter 4, is mirrored in its complicated systems for assessment. These multiple systems attempt to reflect and address the many environments in which assessments are carried out and the varied purposes for assessment. They are, however, confusing and difficult to navigate. For this reason, the LCO has recommended clarifying standards and basic procedural rights, to better guide both those who seek or provide assessments and those who are subject to them. As noted above, the appropriate application of assessments is connected to access to basic rights; therefore, it is important that individuals be able to access assessments as necessary and to be provided with adequate and appropriate procedural rights. The LCO is concerned by widespread reports of shortfalls in procedural rights for persons found legally incapable under the HCCA. Given the complexity of the system and current restraints, the LCO has identified a number of immediate steps which can be employed to strengthen the current rights information regime. These steps include the creation of consistent minimum standards for rights information, and strengthened oversight, monitoring and educational roles for existing institutions, including Health Quality Ontario, the Local Health Integration Networks, and the Ministry of Health and Long-term Care. Over the longer term, it will be important to identify how the most vulnerable individuals can have access to advice about their rights that is independent and expert. These practical steps will assist in clarifying understandings of the purposes of assessments and the processes associated with them, promote consistency, improve quality, and strengthen access to rights. Overall, this should improve system navigation both for users and professionals, empower individuals and their families, and reduce incorrect assessments, thereby promoting the appropriate use of substitute decision-making in those instances where it is necessary. The quality of assessments of capacity and the ability of those who are assessed to access their rights are closely associated with concerns regarding education and training, issues dealt with at length in Chapter 10. This Chapter did not address in- depth concerns related to the mechanisms available to challenge the results of assessments of capacity, a topic which is dealt with in Chapter 7, dealing with rights enforcement and dispute resolution. Issues of access to high quality, consistent and appropriate assessments of capacity also underlie issues related to external appointment processes (particularly in the case of statutory guardianship), which is addressed in Chapter 8, as well as some issues related to personal appointments, which are the subject of Chapter 9.